Jade’s emerald green wings sparkled and twinkled when the sun shone on them. During the day, when it was very hot, Jade, the cicada, rubbed his wings together to produce a musical humming sound. The other cicadas in the trees hummed too, but none sounded as beautiful as Jade. One hot day, as Jade sat in the top of a willow tree humming, a bird walked along the path below, pecking at the seeds and grass. Its feathers were greenish-blue and the bird wore a crown of golden feathers on its head. Its long feathery tail had round markings that looked just like eyes in the center of each plume. Jade had never seen anything like this bird before. He flew down and landed on a branch. "What kind of bird are you?" "I’m a peacock. My name is Hu-Long." He spread out his tail in a colorful display. "I’m a cicada. My name is Jade. You are a beautiful bird." "You are a beautiful insect." Hu-Long bowed his head. "Can you sing?" Jade puffed up his body with pride. Just then Hu-Long let out a caw. It was loud and high pitched and echoed off the tall mountains. "You sing as beautifully as you look. I can hum." Jade rubbed his wings together quickly and made a humming sound that filled the valley. The melody made the leaves on the willow trees vibrate. "You also sound as beautiful as you look. Maybe we can sing together and fill the whole land with music," Hu-Long suggested. As the two stood discussing plans, a bee landed on a rock at the bottom of the willow tree and started buzzing. "Your buzzing sounds beautiful. Jade, the cicada can hum. My name is Hu-Long and I know how to caw. Listen.” The two harmonized. Chun-Ho, the bee buzzed and shook. "Let me join you." The three filled the land with a joyful melody. Other animals came to see who was making the beautiful music. A cow eating in a nearby field, waddled over. Jun-Lee asked if she could join in. She let out some loud moos. Jade, Hu-Long, Chun-Ho and Jun-Lee sang beautiful music. Soon a monkey swung down from the top of the willow tree. "My name is Manchu. Your music brings joy to my heart. May I join in your chorus?" He jumped around and pounded his chest. It had a strong beat. Soon Jade, Hu-Long, Chun-Ho, Jun-Lee, and Manchu filled the valley with their beautiful voices. Shin-Yong, a tiger, came by and roared. Fo-An, a water buffalo, plodded out of the river and joined in with its belches. Ushi, a nightingale, chirped. Soon the whole valley was filled with a chorus of beauty. 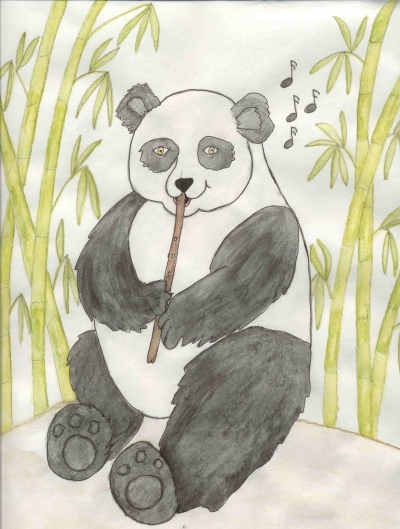 High up on the mountain, in a forest of bamboo, sat Quon-Shen, a panda. He heard the music from the valley. He ate his bamboo leaves and wondered where it was coming from. Curious, he climbed off his tree, carried a cane of bamboo and sauntered into the valley. He came upon Jade, Hu-Long, Chun-Ho, Jun-Lee, Manchu, Shin-Yong, Fo-An, and Ushi singing. "May I join in?" The animals stopped. "Panda bears can’t make noise," Jade said. The others nodded in agreement. Quon-Shen took a piece of bamboo from behind his back. He poked a few holes in it and blew through the biggest. Flute-like music flowed from the cane. The other animals were surprised to hear such a beautiful sound. Quon-Shen’s music was more beautiful than Jade, the cicada’s, Hu-Long, the peacock’s, Chun-Ho, the bee’s, Jun-Lee, the cow’s, Manchu, the monkey’s, Shin-Yong, the tiger’s, Fo-An, the water buffalo’s, and Ushi, the nightingale’s. Quon-Shen played more music for them. As the sun set behind he mountains, Quon-Shen still played his bamboo flute. Never had the valley heard such beautiful melodies as they heard that day.